If the 1880s were years of general growth and prosperity for Ernst Nusbaum and his family, the 1890s were years of loss. Once again, the Nusbaum/Dreyfuss family lost a young member of the family to suicide. 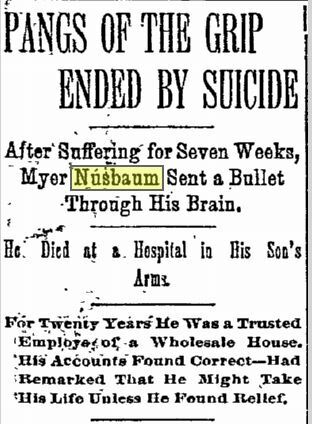 On January 18, 1894, Myer Nusbaum, 41 years old and the father of two young teenagers, took his own life. Here was a man of a steady and upstanding reputation, a bookkeeper for a clothing company who had been employed in one place for over twenty years, a man who was well-liked and active in his community, a man with a wife and two teenaged children. What was this “grip” that caused him so much pain that he felt he had no alternative but to end his life? From what I can gather from various sources on line, the grip was a term for what we would today call influenza or the flu. I’ve had the flu. Probably all of you have had the flu at some time or another. It’s awful. You feel terrible. Your head hurts, your body aches, you have respiratory symptoms, sometimes stomach symptoms. It can last for many days. But most people don’t become suicidal. 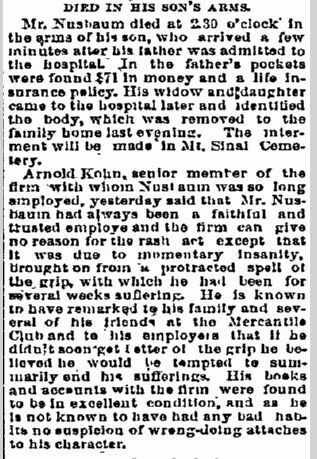 Although the headline on the Philadelphia Times story about Myer says, “Another Grip Tragedy,” I would imagine that even back in the 1890s, most people did not intentionally end their lives while suffering from the flu. 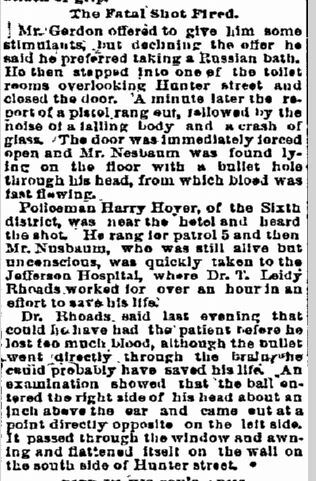 Somehow I have to believe that Myer’s illness was something more than influenza, but it just was not diagnosed. The Inquirer story says he had been suffering for seven weeks; I have never heard of the flu lasting that long, but maybe it did back then. He must have been suffering terribly to have been driven to such an extreme. Imagine his poor fifteen year old son Jacob, watching his father die in his arms, and his wife Rosalie and sixteen year old daughter Corinne having to identify his body at the hospital. UPDATE: My cousin Jessica, an expert in disease and disaster control, sent me a link to an article about the flu pandemic of the 1890s, the so-called Russian flu. It included this quote: “Influenza was also considered to be a major cause of nervous and psychological disorders by acting as a “devitalizing agent.” Descriptions of influenza sequelae included “depression,” “shattered nerves,” “neurasthenia,” and “despondency.” During 1890, for example, an unprecedented 140 melancholics afflicted with influenza “poison” were admitted to Scotland’s Royal Edinburgh Asylum. Coroners also cited influenza as a reason for “temporary insanity” in cases of suicide. Across Europe, rates of suicide (mostly male) and attempted suicide (mostly female) rose during the 1890s. In England and Wales, there was a 25 percent increase in suicides between 1889 and 1893. Paris witnessed a 23 percent rise during 1889–1890 compared with the average, and there were also increased rates in Germany and Switzerland.” Thus, Myer Nusbaum was not alone in suffering severe depression as a result of the flu. You can read more about the Russian flu here. 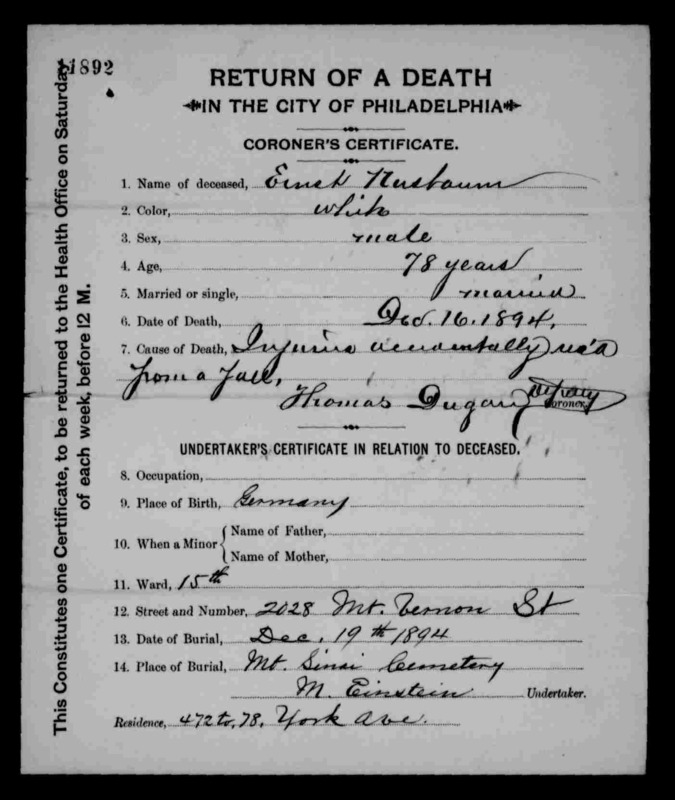 “Pennsylvania, Philadelphia City Death Certificates, 1803-1915,” index and images, FamilySearch (https://familysearch.org/pal:/MM9.1.1/JK96-L2H : accessed 11 March 2015), Myer Nusbaum, 18 Jan 1894; citing 15562, Philadelphia City Archives and Historical Society of Pennsylvania, Philadelphia; FHL microfilm 1,871,367. 1894 ended as tragically as it began. 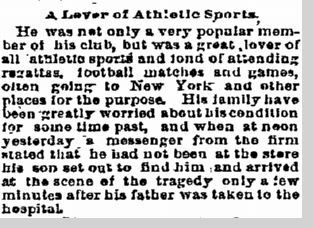 Almost eleven months to the day after Myer died, on December 16, 1894, his father Ernst died from injuries sustained in a fall. Ernst was 78 years old; the last of the Nusbaum siblings in America was gone. And not from disease or old age, but from an accidental fall. Somehow that just seems unfair; he had been able to adjust to life in America, had been a successful businessperson, had bounced back from bankruptcy and the Depression of the 1870s, and had raised six children with his wife Clarissa, and his life had ended because of a fall. Pennsylvania, Philadelphia City Death Certificates, 1803-1915,” index and images, FamilySearch (https://familysearch.org/pal:/MM9.1.1/VKDH-3ZJ : accessed 11 March 2015), Ernst Nusbaum, 16 Dec 1894; citing page 284 certificate # 11892, Philadelphia City Archives and Historical Society of Pennsylvania, Philadelphia; FHL microfilm 1,011,822. As for the rest of the family, Arthur Nusbaum and his wife Henrietta had two more children in the 1890s: Clare, born in 1894, and Helen, born in 1895. There were now six children in the family, and they were living at 2559 North 16th Street. Arthur was involved in clothing sales in the 1890s and as reported on the 1900 census. Their son Sidney, now 21, was also a clothing salesman, and Horace, who was 15, was working as an upholsterer. Fanny Nusbaum and her husband Jacob Hano continued to live in New York City in the 1890s. Fanny and Jacob had five sons (Samuel having died in 1884), all still at home during that decade and in 1900. In 1891, they were living at 119 East 111th Street in East Harlem, and Jacob was a printer and book manufacturer. 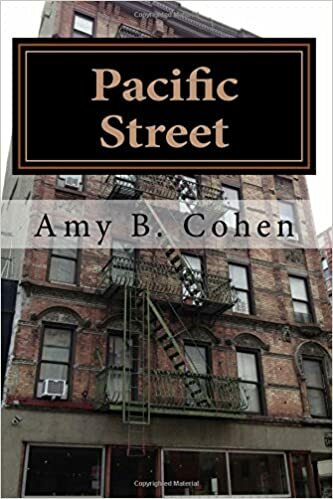 In 1892 they were living at 948 Fleetwood Avenue, which I cannot locate in New York City today, but by 1898 they were living at 803 Edgecombe Avenue, even further uptown, near 171st Street on what is now Amsterdam Avenue. On the 1900 census, the family is living at 203 West 134th Street, and the oldest son, Louis, now 22, was employed as a salesman. The other four were still at home. There was also a servant living in the home. Edgar Nusbaum and his wife Viola continued to live 2029 North 11th Street in Philadelphia in the early 1890s, and Edgar was working as a clerk. By 1897, however, the family had moved to 1520 North 12th Street, and Edgar was working as a publisher like his brother-in-law Jacob Hano. On the 1900 census, however, Edgar listed his occupation as clerk once again. Their daughter Selena, now 19, was working as a dressmaker. Viola’s sister and a boarder were also living with them. Henrietta Nusbaum and her husband Frank Newhouse had been living with Ernst and Clarissa, her parents, in 1890 at 2028 Mt. Vernon Street, and Frank was working as a tailor. They were still living at that address as of the 1900 census with Clarissa, now a widow, and Frank’s occupation was a traveling salesman. Neither Clarissa nor Henrietta were working outside the home, and there were two domestic servants living with them. Frank Nusbaum and his wife Dolly and their daughter Loraine were living at 811 Windsor Square in 1891. By 1896, Frank was selling insurance, and they were living at 637 North 33rd Street; a year later they were living at 3223 Wallace Street. In 1900, the family was living at yet another location, 3206 Manton Avenue, and Frank was still an insurance broker. As for the widow of Myer Nusbaum, Rosalie Aub Nusbaum, she and their children Corinne and Jacob (called Jack on the 1900 census) were living at 5020 Cedar Street in 1900. Jack was working as a salesman, now almost 21 years old, and his mother and sister were at home. There was also a boarder living with them as well as one domestic servant. Thus, somehow the family survived the two tragedies of 1894 and entered the 20th century, all but Fanny still living in Philadelphia, all still working and living their lives. 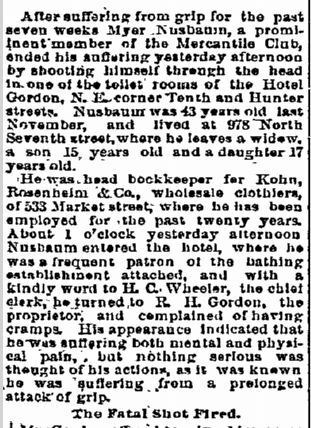 This entry was posted in New York, Nusbaum, Pennsylvania, Philadelphia and tagged 1890s, death certificates, Nusbaum, Philadelphia, suicide by Amy. Bookmark the permalink. Thank you, Jessica, for putting this in context. I knew of the Spanish flu in 1918 or so, but not the Russian flu a generation earlier. The death cert did say “temporary insanity” so that is consistent with what you said. I have to go look at that link. Thanks!! Good timing on my finding the blog; I happen to be something of an expert of pandemics and historical issues relating to them!